Durban: Seamer Vishwa Fernando bagged four wickets as Sri Lanka took the honours on day one of the first test against South Africa by reducing their hosts to 235 all out at Kingsmead on Wednesday. The tourists were 49 for one in reply, trailing by 186 runs on a lively wicket that appeared to get easier to bat on. Captain Dimuth Karunaratne (28 not out) and the attacking Oshada Fernando (17 not out) will resume on the second morning, hoping to lay the platform for a sizeable first innings lead. 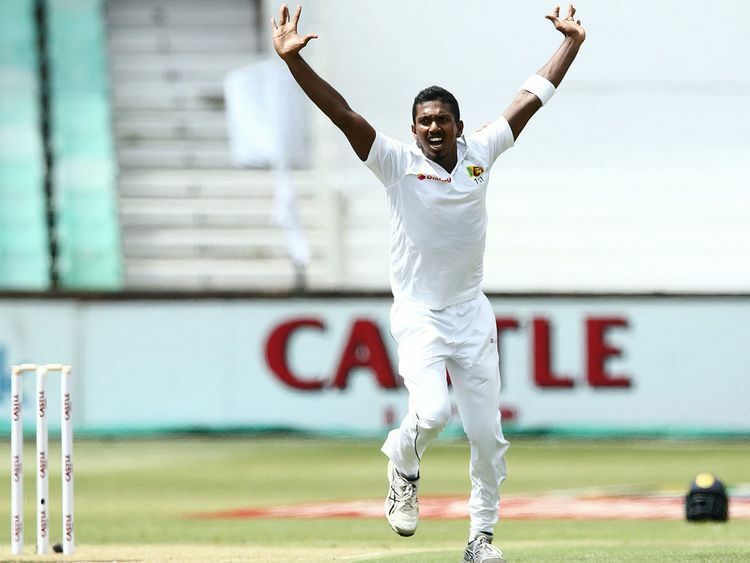 Sri Lanka opener Lahiru Thirimanne was their only wicket to fall, batting for close to half an hour before he was caught by wicketkeeper Quinton de Kock for a duck off seamer Dale Steyn. It was the perfect start to the tour for the Sri Lankans, who endured two heavy test defeats on their recent trip to Australia and have not won a game in any format since October. South Africa's innings was rescued to a degree by a fighting 80 from De Kock before he was the last man out, having at least taken his side past the 200 mark. "We need to get off to a good start tomorrow and try and find a way to strike early," De Kock told reporters. "They (Sri Lanka) have shown some good intent within their batsmen and will look to score quickly. We will have to figure out how we go about getting wickets." HELPFUL WICKET De Kock said they were not surprised by the quality of the visitors' bowling attack on a helpful wicket. "Sri Lanka have always had a good pace attack, they have skill and their lines and lengths were tight as always. Here, a bit more movement off the wicket really assists them." After winning the toss and electing to bowl, Sri Lanka had South Africa three wickets down with 17 runs on the board before Faf du Plessis (35) and Temba Bavuma (47) put on 72 for the fourth wicket to calm home nerves. But the tourists continued to chip away at the wickets column despite a positive run-rate from the hosts. Fernando (4-62) was impressive with the new ball as he had both openers Dean Elgar (0) and Aiden Markram (11) back in the changing rooms early. Bavuma showed good application before he was out in unfortunate circumstances, a straight drive from De Kock deflecting off the boot of bowler Fernando and onto the stumps with the batsman out of his crease. Keshav Maharaj (29) put on 47 with South African keeper De Kock but was caught by Niroshan Dikwella off Fernando just before tea, with South Africa adding a potentially crucial 57 before being bowled out.